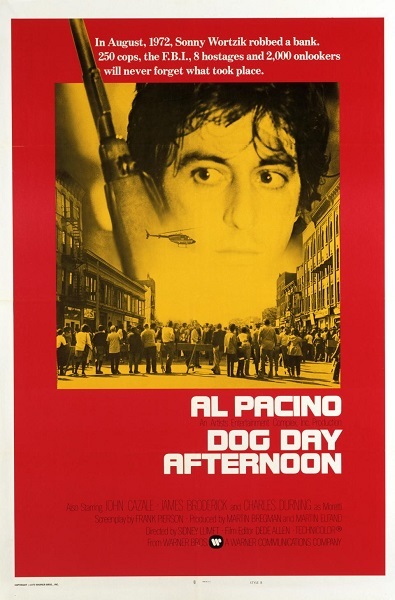 Corinne and Tim spend a hot summer day discussing Dog Day Afternoon, Sidney Lumet's gripping portrait of a bank heist gone wrong. Topics include the amazing true story that inspired it, the intensity of young Al Pacino, the film's depiction of gay and transgender characters, and its influence on subsequent heist movies. Warning: Contains explicit language, spoilers, and ATTICA!! ATTICA!! ATTICA!!! Do you want to make travel plans to Algeria? Care to debate the decibel level of Pacino's acting style? Feel like commiserating about how we'll never get more John Cazale performances? Leave a comment below and keep the discussion going. Very astute commentary. Interesting that in this time of constant remakes, this film and Serpico have not been remade, reimagined or rebooted. Compare Pelham 123 and Shaft. I think NYC in the 1970s is a very difficult thing to recapture. I hate to say it but given a long enough timeline, both of those probably will be remade, though it feels like so much of Dog Day Afternoon has been absorbed into other movies already. But you're right: the era is much more difficult to create than getting some period cars and clothes. I can't help but wonder if given some of the subject matter (bisexual main character, transgender woman) whether a remake in this day and age would become too much of a message movie. One of the great things about the film is how Lumet declines to make any definitive judgments toward the characters, simply presenting them as they are, another trait that contributes to the realism of his films. And don't even get me started on that Pelham 123 remake.